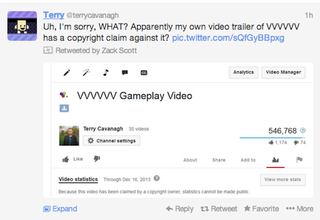 Has the YouTube ContentID fiasco gotten absurd enough yet? This one's via Twitter and there appear to be more and more like it, with creators seeing their own work deemed by YouTube's copyright bots as the property of someone else. Cavanagh is disputing the claim, which is being held by a company called IndMusic. Hopefully this gets sorted out.